Lug Wrench first reported on the Iron Brewer contest in a post in November 2010 and I have been following the competition ever since. Iron Brewer is back again in 2011 with the same concept - brew a beer with three randomly determined ingredients within 2 months of the round's start date. The winning beer for that round will be the beer that best features the secret ingredients, and is selected during a live Internet radio broadcast with the competitors. The winner of each round advances to the championship competition at the end of the year, where the real prizes are, aside from bragging rights. I have used all of the ingredients before, except the rose hips. The research I have done so far indicates that they could add a fruity and slightly spicy flavor, possibly like cranberries. 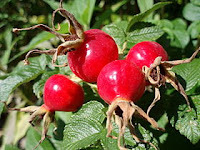 I hope to make a tea or extract out of the rose hips to get a sense of what they can do and the potency of their flavor. I am excited to see what the other competitors do with these ingredients. If any of our readers has recipe suggestions for how to use the secret ingredients, please post a comment and let me know. I am fairly certain of what direction I am going, but I am curious what others may think. Best of luck to all of the Iron Brewer competitors.